I’ve wanted to do this for a while now, and if anyone would like to join in and make it a blog hop, I’d be delighted. 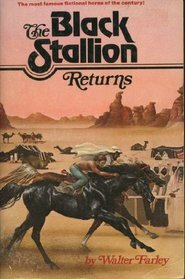 In short, on Fridays this summer, I’ll be re-reading the books in Walter Farley’s Black Stallion series. I’ll try to match up what I read with my childhood memories, point out absurdities, revel in nostalgia, and raise some bigger picture questions. They span 42 years of publishing; Walter Farley wrote the first book while still in high school, which explains a lot. There are some real highs (no joke, I still get choked up thinking about the end of The Black Stallion and Satan) and oh boy, are there some lows that I bet we’ve all repressed together. I’ll get to them all. Obviously, this will take me past the summer and into the fall – I’ll decide in September or so whether I want to keep going or save the second half of them for next summer. 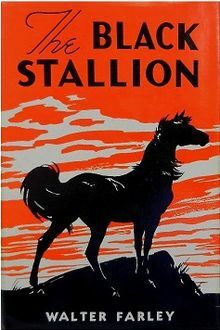 Next week, I start with The Black Stallion itself, the OG. I started reading it earlier this week and my most pressing question so far is what exactly does it mean when a horse whistles? Can someone help me puzzle this out? It’s clearly not a high pitched screaming whinny, because the Black also screams CONSTANTLY. But he announces every.single.thing. he does with a whistle and it’s making me crazy.